Ashburton based trainer Bart Rice jets off to Italy today to represent South Africa in the International Amateur-Drivers Challenge. Rice accompanied by his wife Pam, will be representing Harness Racing South Africa and will help cement South Africa's international ties with the sport. Germany, Netherlands, Sweden, France, Spain and The Ukraine. It is a four day festival but the driver challenge is held over two days. July 30-31, in the Southern Italian city of Taranto. Rice is excited about the trip although nervous because of his relative lack of experience. "It's a very tactical sport so I hope to gain a lot of experience and learn from the other drivers". 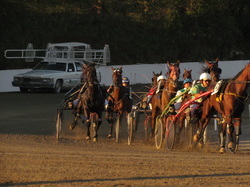 "I have never raced on a proper harness track before but driving sulky's is great fun," he said. The latest Gold Circle Chapter Challenge Finals were held on Saturday and provided three worthy winners in the Bart Rice trained, The Walrus (1200m), the Dennis Drier trained, Star Empire (1600m) and the Paul Lafferty trained, Fort Noble (2000m). Fort Noble produced a sustained finishing effort to beat the Rice trained Royal Day by a length. Rice was disappointed not to have gained the Chapter Challenge Double and revealed that according to Bernard Fayd'Herbe, Royal Day had shirked the issue at a crucial stage before running on strongly, by which time it was too late. Fayd'Herbe had earlier ridden a typically cool and well timed race to win on Rice's, The Walrus. The five year old Devine Act gelding, claimed a hat rick of sprint wins in the process. He has had his problems and was fitted with the cornel collar prior to his second win in October 2008, as he used to displace his soft palate, a condition which affects a horse's breathing. He was also off with a pelvic injury for about 10 months, returning this year in January and following through with three superb wins. The season is heating up and visiting trainers have moved in making things more difficult for the local contenders. But the "locals" did themselves proud and Dennis Drier managed seven winners while Michael Roberts and Kumaran each had six. Bart Rice, a young trainer with a relatively small string, held his own on a very competitive stage against top stables to secure four winners - a performance worthy of recognition with the monthly trainer award. Well Done Bart. When a horse makes its debut beyond its 3 year old career, the usual assumptions would be that it has had some serious soundness issues. Race goers who glanced at their race cards last Sunday at Scottsville to see the six year old Bart Rice trained Gallic Saint making his debut might have expected to see him accompanied by a wheel chair. However, Gallic Saint is, in fact sound. Rather, he proved himself as a young horse to be more suited to Rodeo than racing. His previous trainers exasperated by his unwillingness to be broken in, even after being gelded, eventually returned him to the breeder. He consequently arrived at the Rice yard as a late 5 year old. The Rice's described him as "a very gentle and kind horse, who would never intentionally hurt anyone". When girthing him up he would bolt forward in fright, he would only go about 50m or so before stopping and then would be consoled". "He was full of fear and anxiety, he just needed to learn to trust again". He gradually conquered his fear of being girthed up, but the first time they put a rider on him he bolted forward once again and showed skills of being a bucking bronco, that would have attracted the attention of passing Texans. The rider was soon on the ground. The Monty Roberts methods were than adopted. Keeping him still, the rider would lie across the saddle, building up the horses confidence and trust. He would then be lead around. Bart's wife Pam, did most of the riding on "Crazy" (Gallic Saints nickname) and built up a tremendous bond of trust with her. Having finally broken him in, he proved impossible at the starting stalls until Pam led him forward, at which point he walked straight in. He made a satisfactory debut over 1400m, finishing 6th, he will come on from the run and will be better suited to 2000m and further, so looks to have a chance of winning a race or two. The centuries long relationship that man and horse enjoyed is something the anti-racing brigade appear to ignore, for the bond between trainer and horse is particularly strong. This could be best summed up by two quotes from British trainers, one, David Nicholls, who said, "Bad horses are no good to any fella, but trouble is you get attached to the bastards", and two, Nicky Henderson, who said " The wonderful thing about having old horses is you get to know them so well , its like reading your favourite book, he tells you if anything isn't quite right - he can almost talk". A recent example locally is provided by the case of the seven year old Casey Tibbs gelding, Well Saddled, from the yard of Bart and Pam Rice. "We retired this gelding last year in June, He had been an absolute pleasure to train, as apart from his ability he had tremendous determination. We could not let him go a decided to keep him as our own. During his 10 month retirement he stayed at a small holding where we keep some of our yearlings and two year olds. He looked after these youngsters like a true gentleman and taught them what they needed to know. when the time came for these babies to come in, he yet again accompanied them to the track in the mornings and began to show us that he wanted to make a come back, which he has now done". 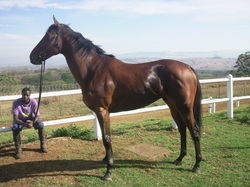 In his first come back run he finished 3rd at Greyville at odds of 14-1. At that point Bart told his website clients to keep an eye out for him and duly finished second a run later at Greyville, just over a week ago, paying a handsome R6,80 a place. Instant turn around, Well Saddled joined the yard as a battling one time winner from Cape Town in 2006 but thrived in his new environment and found the winners enclosure three times within five months. He claimed another victory before hanging up his alumites for the first time a looks to have another chance at adding to that tally in his second career. The Rice's currently have a few other horses worth following, they strongly fancied Lady Charlotte to win at Scottsville, as did the public as she started tote favourite, However, her chances were compromised at the start after a delay saw her standing in the gates for some five minutes, bad enough in itself, but worse in that she began kicking the back gates before the starter pressed the button. She did very well under the circumstances to finish fourth in the 16 horse field and is definitely one to follow. Another one is Fricker Road who seemed headed for South Africa's last gasp racing centre, Kimberly, after trying 35 times without success. Upon arrival at the Rice yard, his fortunes have changed and he has earned stakes money in all five of his starts including a win at Clairwood in which he paid R13.90. He finished just 1.30 lengths back in 5th in his first start out the maidens at long odds on Friday night, and was a touch bit unlucky as he was bit keen early on in the race. Following the Rice's would certainly have paid a few bills as beside the aforementioned windfalls, Nickelodeon paid R7.60 a win at Greyville two weeks ago, while yesterday Que Prospect came form last to finish third at odds of 20-1 in the only race that went ahead at Greyville. 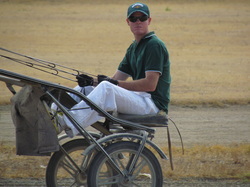 On top of that Bart has been the victorious driver in two of the three harness races run on South African soil to date. The Rice's expect both Fricker Road and Qui Prospect to find the winners enclosure soon, the stable star, the stakes winner Royal Day, is a nominee for the betting world 1900m on May 22. One of the most unluckiest horses around so far as draws go, he has yet again drawn way out wide. Another useful horse in the yard, The Walrus, is out with a long term pelvic injury. It was a race filled with adrenalin and excitement, the second Harness race held on South African soil, a tight fun filled finish between Rice and the Swedish Harness Trainer/Driver, Johan Nilsson, victory went to the Rice driven Carla Kemp. For the spectators who shared this evening, it was an experience of a life time. A fete like atmosphere permeated through Greyville on Friday night as over two years of tireless work came together in a pleasing fashion for South African Harness Racing Chairman, Dean Latimer. Indeed, the form of the first race stood up as Quickness Brew, this time ridden by Swedish professional, Johan Nilsson, was denied by the shortest of short heads by Carla Kemp, driven by Bart Rice, and their exciting duel over the last 300m had the crowd on their feet and cheering. Carla Kemp, an eight year old Swedish bred mare, is owned by Dale Rousseau and Marco Peterson. 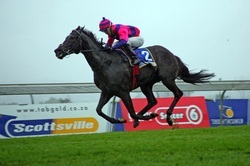 Victory went to the 6 year old Modern Day Gelding, Royal Day in the Michaelmas Handicap at Greyville. Credit goes to Jockey Alec Forbes for this top class ride from the widest draw. Royal Day bags his 6th career win from 27 outings, with earnings exceeding R500 000.00 and a win rate of 22%. Bart Rice-trained Royal Day is an entry in the Canon Gold up on 1 August. But is holding thumbs that Royal Day makes the final cut for the Canon Gold Cup in 2½ weeks time when the field is announced next Tuesday. Rated 89, Royal Day is not guaranteed a berth in the field for the country’s most important marathon event and with horses like Mike Bass’ smart stayers Diamond Quest (the back-to-form 2006 winner of the R1.2-million race), Bill Of Rights and Thundering Jet as well as Mike de Kock-trained Equal Image and Ormond Ferraris’ champion stayer Santa likely to line up, he is unlikely to even be amongst the fancied runners. But Bart Nathan Rice knows exactly what it takes to win a race of this calibre (after all, he has the Castle Tankard and the silverware from several other feature races in his trophy cabinet) and Royal Day will be primed to run the race of his life if he gets into the 1 August event. 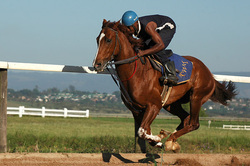 Durban-born Rice (turns 33 on 15 September) and his wife-come-assistant trainer Pamela are relative "newbies’’ on the Durban racing scene, having relocated there three years ago. On leaving school Rice took a job with Mike Clements, who subsequently emigrated to Singapore where he is training with some success. He worked for Clements for two years from 1994 before "moving around to a couple of the smaller trainers, like Gary Jolliffe and Brian D’Quino’’. "Mike had some nice horses, like Just Money, who won the Castle Tankard, six-time winner Misty Wind and a good three-year-old called Just Andre. I learnt a lot from him,’’ he mused. 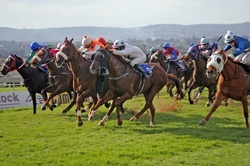 Another highlight in Zimbabwe was saddling four winners on 25 September 2005 – Mimosa, Quick Exit, The Winklemann and Scherzo, who won the feature race on the day. In 2005 several of his patrons encouraged him to turn his eyes south of the Limpopo towards the richer purses on offer here and he brought six horses to the Vaal in January 2005, enjoying a measure of success. That led to his decision to come back to South Africa permanently. According to his website, the late Neil Stone of Goldstone Stud near Bulawayo – the stable’s biggest owner until his death earlier this year – financed the move as well as providing the transportation for the best of his Zimbabwe stock. One of his biggest accomplishments on SA soil has been with a former Izak Cronje-trained horse called Well Saddled. He is owned in partnership by Rice’s principal patrons Domingo De Abreu and Phivos and Brenda Michaelides, owners who sent him horses out of the blue and people he describes as "not just patrons, they’re like family now’’. "Well Saddled was a battling one-time winner when we got him in May 2006 and he won four races for us before we retired him in 2008,’’ said Rice, who has become so fond of the Casey Tibbs gelding that he sent him to a small-holding as school master to his youngsters. So Rice, who likes to keep himself as fit as his horses and plays indoor soccer a couple of times a week, put the seven-year-old back in work and Well Saddled is still paying his way, having placed in three of his six starts this year. While Royal Day, winner of the Michaelmas Handicap at Greyville last year, is currently the best horse in the yard, Rice also rates The Walrus as a horse who will earn his keep once he returns to action following a rest. The Divine Act gelding has won twice and placed another five times in his 13 career starts. Another of Rice’s outstanding achievements has been his transition from guiding horses around a show-jumping arena to driving a sulky round Greyville in the country’s first four harness races. He’s won two of the trots and has had a lot of fun mastering this different genre. Having saddled around 125 winners during his short career – in spite of his current small and fairly moderate string – Rice is adamant that this is just the beginning. "I’d like to have around 40 horses, which is a manageable number,’’ he said. "Each of our horses work is geared towards its individual needs and we quickly get to know their quirks as well as their likes and dislikes. 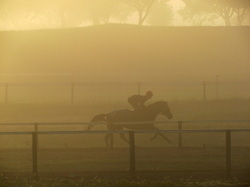 "Being a successful trainer starts at the sales, in picking the horse. I first look at a horse’s conformation. I like a strong hind-quarter and gaskin, as well as a nice, deep girth. Then I look at the pedigree – but when you don’t have deep pockets at sales, you tend to be thankful to get something that looks decent! Bart Rice is the newest addition to the KwaZulu-Natal training ranks and in a few short months is already making ripples. 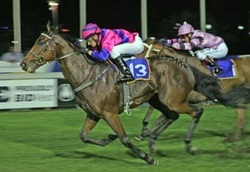 The gelding Well Saddled arrived at his yard as a battler who had managed just one win and two places in 16 starts in the Cape, but under Rice's care has reeled off three wins and a second in just seven outings. 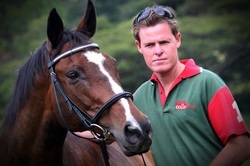 Rice trained Millstar to win one of Zimbabwe's biggest races, the Castle Tankard, in 2004. His fiancé at the time, Pamela Geach, had leased the filly and the couple banked the lion's share of the zw$27 million prize money. Rice trained the likes of Scherzo, 8 time winning sprinter of the year and horse of the year, Fire at Dawn, Group winning 2 year old filly and 2 year old filly of the year, Arabesque Delight, also a black type mare, he is no stranger to the winners enclosure and never disgraces his stable in the big races. This is not to say that Rice was desperate to leave the troubled land north of our borders. "Living in Zim is not as bad as people think, you might have to queue for petrol but you still make your bread and butter" he says. He and Pam loved their racing at the Borrowdale Race Course in Harare with its wide and sparingly used surface, not to mention the special atmosphere created by a tight knit community of owners and trainers. Many breeders have either departed or have had to cut down their operations due to lack of grazing land while the best sires like Goldkeeper and Manshood (sire of Ipi Tombi) have been snapped up by South Africa and Kitalpha by America, meaning that it's unlikely that another Ipi Tombi, who Rice relates was a national hero who uplifted the whole country, will pop up. Loyal owners are keeping Zimbabwean racing alive and it is some of Rice's patrons who suggested late last year that he give South Africa a go. For them it was the higher stake that were the draw card while for Rice it was the combination of this and increased competition, which he thrives on. His reconnaissance mission with six horses to the Vaal was a success with his first two runners finishing 2nd (Southern Eclipse) and 3rd (Tarator) on the sand. The trainers were very welcoming at the Vaal but he didn't have a secure barn and decided in April to move down to Ashburton where he also felt his horses would be more competitive, he now has a barn with an office and 30 horses and is hoping that a further 10 - 20 boxes will become available to him. Ashburton is a very similar set up to Borrowdale just on a smaller scale, and Rice has a good view of the gallops from his ring. His grooms and track riders are good and his is also supported by top jockey's such as Sean Cormack and Anthony Delpech, together with some promising apprentices. With the superior feed here, Rice can put more work into his horses than he used to.